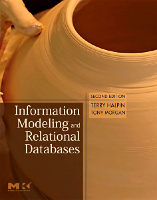 Welcome to the website for Halpin, Morgan: Information Modeling and Relational Databases, 2nd Edition. These are the odd numbered solutions. The even numbered solutions are for instructors only. A Visio stencil and template for drawing ORM 2 schemas, as well as a sample schema, are accessible in the following zipped folder. This stencil requires Visio standard edition (or higher), and is for drawing only, not code generation. It is completely separate from the NORMA tool. The former ORM tool known as VisioModeler is freely available as an unsupported product from Microsoft Corporation (as a 25 MB download). Note: This uses the old ORM 1 notation rather than the ORM 2 notation used in the second edition. Although VisioModeler works with versions of Microsoft Windows up to Windows XP, it does not work with Windows Vista. To obtain the free VisioModeler download, go to http://download.microsoft.com which should take you to the following page http://www.microsoft.com/downloads/search/asp? where you can search by selecting Keyword Search, entering the keyword "VisioModeler" and selecting your operating system (e.g. Windows XP or Windows 2000). This should bring up a download page that includes the title "VisioModeler (Unsupported Product Edition)". Clicking on this will take you to the link for the download file MSVM31.exe. Click on this to do the download. An errata file is being maintained at http://www.orm.net/Errata2.htm to note typos or other errors detected in the second edition of Information Modeling and Relational Databases.Click for current errata.